Despite having the world think that curry originated in India, any competent cook in India will tell you that in Indian cuisine, there is no such thing as curry. There is spice paste which comes in many varieties. Very few of us who don't know the intricacies of Indian cooking will not be able to recognize all of them but we know curry or, at least, that yellow powder or paste made up of several spices. Curry, as we know it today, comes in three colors—yellow (the most familiar), green and red. When we say fish head curry, referring to that Singaporean dish that has become a modern legend, it would seem that because the sauce is red, then red curry must be the chosen curry variety. But that is more apparent than real. Because there is really is no curry ("curry" dishes in Southeast Asia are all Indian in origin), the red sauce of fish head curry is, in reality, a spice mix—sambal, in Malay cuisine—unique to every cook and every food stall. And that is why the fish head curry from a certain food stall may taste better than the fish head curry served in others. Rinse the salmon head halves and pat dry. Pry or scape off as much of the scales as you can without damaging the skin. Heat the cooking oil in a wide frying pan. Saute the shallots, garlic, ginger, tomato and chilis with a little fish sauce, until fragrant and softened, about two minutes. Pour in the coconut milk. Season with more fish sauce. Bring to the boil. Cover the pan, lower the heat and simmer for 12 to 15 minutes or just until done. Taste the sauce occasionally and add more fish sauce, if needed. Scoop out the fish head halves and transfer to a shallow bowl (or two shallow bowls). Pour the sauce over them. Garnish with fried onion slices, toasted garlic and snipped cilantro before serving. 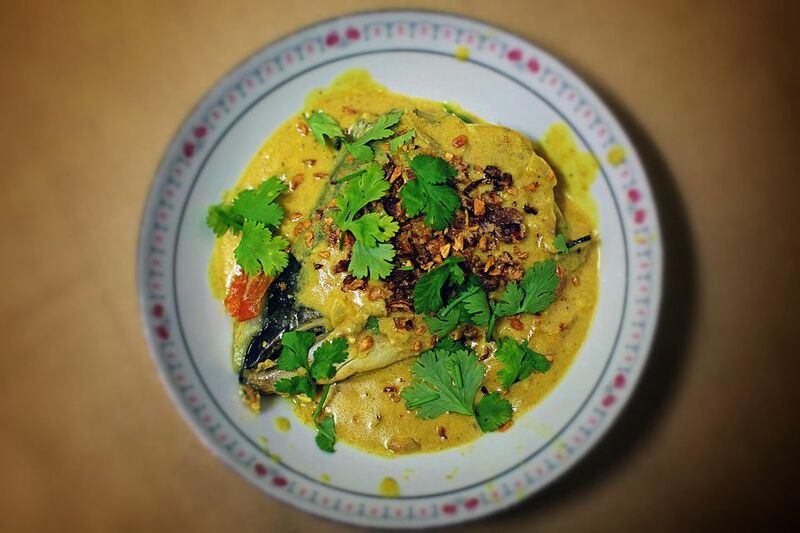 In this recipe, fish head curry is cooked with grocery-bought curry paste for convenience so that cooks making the dish for the first time will not get overwhelmed by the number of spices that need to be toasted and ground to make the base for the dish. We used yellow curry paste; you can always opt for green or red. The cooking time is based on the weight of the fish head. The larger the fish head, the longer the cooking time. You may also need to adjust the number of ingredients if using a fish head that weighs more than half a kilogram.